Some more dangerous nonsense. This Tory led Coalition is now proposing to get rid of an important health & safety protection that was first introduced in 1898. What next? if you fall ill, become old or unemployed - will they be reintroducing the workhouse? I shouldn't give them ideas I suppose. Sign the e-petition to force a Parliamentary debate and pass on the link. 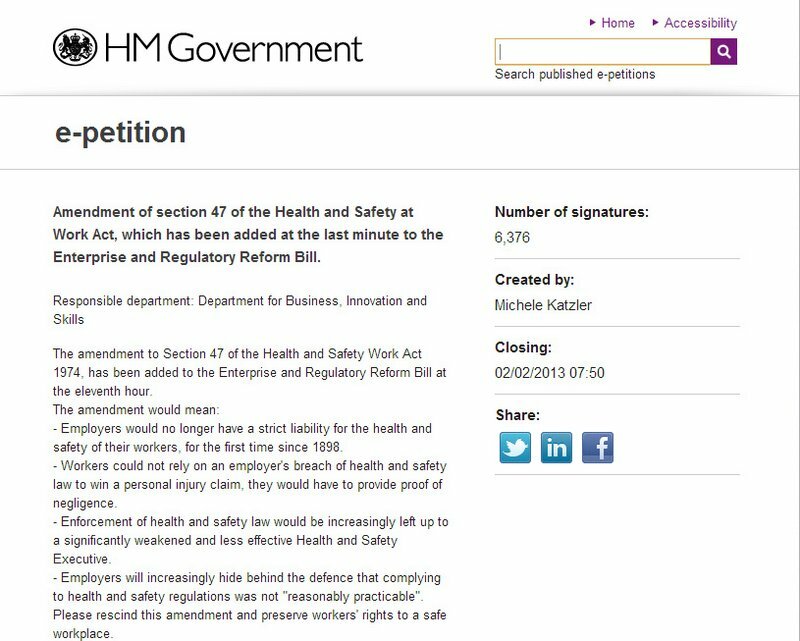 "The amendment to Section 47 of the Health and Safety Work Act 1974, has been added to the Enterprise and Regulatory Reform Bill at the eleventh hour. - Employers would no longer have a strict liability for the health and safety of their workers, for the first time since 1898. - Workers could not rely on an employer's breach of health and safety law to win a personal injury claim, they would have to provide proof of negligence. - Enforcement of health and safety law would be increasingly left up to a significantly weakened and less effective Health and Safety Executive. - Employers will increasingly hide behind the defence that complying to health and safety regulations was not "reasonably practicable". 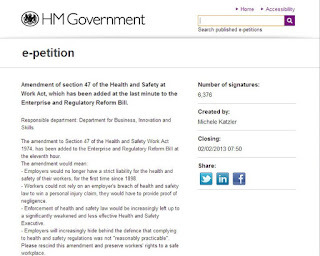 Please rescind this amendment and preserve workers' rights to a safe workplace". 560What are they thinking of. this is what ring wing Tories do Peter when they are in power. They have a complete contempt for working people. Why on earth Vince Cable and the Liberal Democrats are supporting this measure is beyond me.